On Sunday, September 25, the Alden Sherman Classic, an informal invitational concours was held in Weston, Connecticut on the grounds of the handsome local high school. The usual modern marques were there in force: Jaguar, including two replica D-Types, Ferrari, with a 250 Lusso that was the most appealing to my taste, Lamborghinis and Porsches. A representative of the Riley Club was there with a very spiffy Riley Sports saloon. Many of the most popular American makes, such as Cadillac and Chevrolet, were there in abundance. Outstanding among the Americans was a gorgeous silver Packard, which I believe to be a 1932 Phaeton. Unfortunately I didn’t get a photo of it. My main interest, of course, was the Bugattis, of which there were five present, and the sole Amilcar. A beautiful Type 57 cabriolet with a black and ivory body by Gangloff belonging to event host Alden Sherman represented the luxury side of the Bugatti character. A Type 49 recently re-bodied in the style of a 1932 American roadster was strikingly handsome, and not quite as heretical as one might think, since at least a couple of Type 43 Bugattis were similarly bodied by Jean Bugatti back in the day. In addition, there was a Type 37A that is frequently raced in Vintage Car events, and two other T.37 GP cars, one of which is also the property of the event host. Gibson Rheault relaxed in his family’s very well-traveled Type 37. 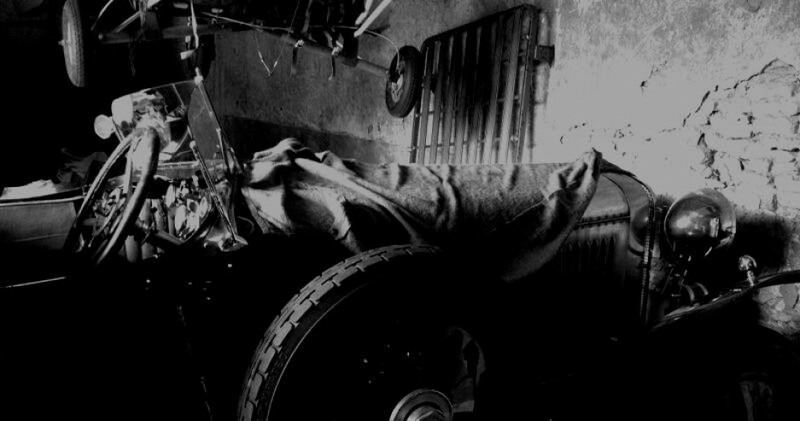 The Amilcar appeared to be in the process of restoration, with its incorrect wheels and tires and Willys engine. But its fanciful fenders, staggered seating, rakish two-piece windshield and elaborately shaped cowling around the steering wheel attracted the interest of devotees of unusual pre-WW2 cars.